Purchased in October of 2005 after an eight-year capital campaign, the Dennis R. Neill Equality Center underwent a complete overhaul through over 7000 hours of volunteer-led renovations, opening in February of 2007. Our beautiful 18,000 square foot facility now represents the design work of a team of professional designers. 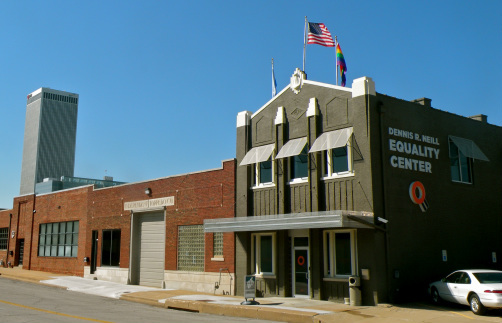 Featuring an event center, a full-service lending library, a wellness center and more, the Dennis R. Neill Equality Center is a visible presence of LGBT equality in Oklahoma.